Find your lost friend, Sam, as you recover from a bad hangover. Sam thinks he can drink you under the table. Is he right? Meet Sam Guevenne and accept the drinking contest. Help clean up the Temple of Dibella. 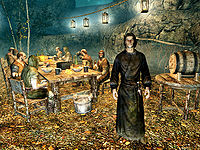 Ask about Sam and the staff in Rorikstead. Talk to Ysolda in Whiterun about the staff. Search Morvunskar for Sam and the staff. Receive your reward from the Daedric Lord Sanguine. Once you reach level 14, you may meet Sam Guevenne in any pub or tavern. He will challenge you to a drinking contest, offering to award you a staff if you win. Sam reaches his limit after his second drink. You can win by taking a third drink, after which a drunken Sam declares you the winner. However, before awarding the staff, Sam wants to take his new drinking buddy to "a place where the wine flows like water". At this point your mental blackout begins and the screen fades to black until the next day. "Wake up! That's right, it's time to wake up, you drunken blasphemer!" 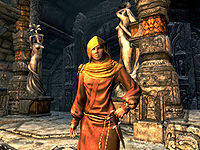 You will be woken by Senna, the priestess in the temple of Dibella in Markarth. When you ask about what happened, she states you were blathering about a wedding and a goat, or blaspheming the statuaries by fondling. You apparently made quite a mess of the temple, so she asks you to clean up the temple and make amends. Was a man named Sam with me? Dibella teaches love and compassion, but that doesn't mean we're just going to tell you what you want to know and let you walk away from this. Pick up your mess, then apologize, and if we think you're sincere we'll consider lending you aid. I'm sorry, I don't even remember how I got here. (Persuade) Passed: Well, you were deep in your cups when you got here. You were ranting but most of it was slurred. You said something about Rorikstead. Failed: Oh, I'd love to help you figure it out, but I'm so busy cleaning up the mess you made of our temple... Now if you were to help tidy up and perhaps apologize afterwards... I might be able to help you. Tell me how I got here and I'll pay for the damages. (Bribe) Passed: Well, we can always use contributions. You were ranting when you got here but most of it was slurred. You did say something about Rorikstead . Maybe you should take a look there. Failed: Oh you must be nobility of some sort. Running around partying and paying others to clean it up. I don't think so. Clean up your own mess. If you apologize, you will learn a little bit more information about what happened. You will have to pick up several seemingly meaningless items, namely, a giant's toe, two bottles of Alto Wine, and a confusing note from Sam. According to the note, you need these items, now marked as quest items, and a Hagraven Feather to fix the staff you were promised. You can skip the cleanup through persuasion or bribe. If you avoid cleaning up, you need not worry about trying to get the items. After you clean up the temple, the priestess tells you that when you got there you were saying something about Rorikstead. Head on to Rorikstead and when you arrive, look for Ennis. He will indignantly rebuke you for stealing his prized goat, named Gleda, and selling her to a giant. To get the information you need about Sam and the staff, you can pay Ennis 1000 gold for the goat, persuade him, intimidate him, or simply retrieve his goat. What happened with Gleda again? I'm a little fuzzy on that. You really don't remember stealing a goat and selling her to a Giant? Are you thick? Go get her! At least she's bound to follow you back - you smell just like the fermented feed she likes. Did I say anything about where I left a staff? You mentioned something like that... when you were running off with my goat! Tell you what - you bring back my goat, and maybe I'll give a damn about your staff. Help me retrace my steps and I'll pay you for the goat. (1000 gold) Passed: Fine, but I'll still be missing my Gleda. Doubt I'll ever have a prize winning goat again. Most of what you said was gibberish but you left a note. The only bit I could read was "after repaying Ysolda in Whiterun." Failed: There's not enough money in the world to replace Gleda. Tell me everything and you won't end up like your goat. (Intimidate) Passed: Okay, okay. Most of what you said didn't make sense but you left a note. The only bit that I could read said "after repaying Ysolda in Whiterun." That's all I know. Failed: Do what you have to do, I'm not giving up on Gleda. I need to find Sam and the staff, in order to get Gleda back. (Persuade) Passed: I suppose that makes sense. You didn't mention a Sam and nothing you said about the staff made sense. You left a note but it was mostly gibberish, the only bit I could make out was "after repaying Ysolda in Whiterun." Failed: You didn't seem to need either to sell Gleda to the Giant in the first place. I think you'll figure it out. To get Gleda, head south to find the goat wandering around near a giant named Grok. The giant is non-hostile, but once you get the goat to follow you, Grok will decide to attack. It is possible to steal Gleda without incurring Grok's wrath if you sneak up and "talk" to Gleda and then immediately run before Grok notices you, or yield to Grok if he does attack you. Gleda will follow you no matter how fast you run. Another option is to cast Calm on Grok before engaging with Gleda. Grok will not care that you have taken Gleda for the duration of the spell. If you are skilled enough, you can kill Grok. 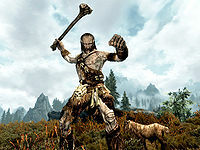 Lead the goat back to Ennis to learn that you mentioned something about paying Ysolda in Whiterun for a wedding ring. Go to Whiterun and find Ysolda. She says that you bought a wedding ring on credit from her, but since there isn't going to be a wedding, she wants the ring back. Your options are much the same as earlier conversations: you can persuade or intimidate her to get the information about Sam, pay her 2000 gold for the ring, or find the ring. "Darling! I've been waiting for you to return, to consummate our love!" "What? You want it for that hussy Esmerelda, with the dark feathers – don't you? I won't let her have you!" Kill her and take the wedding ring from her inventory. Once you have the ring, return to Whiterun and give it to Ysolda to learn where you were going to have the ceremony: Morvunskar. "You're here! I was beginning to think you might not make it." Having learned of the wedding's location, head over to Morvunskar. You will find a lot of hostile mages there. Fight your way into the fort; eventually, after ascending a stairway, a ball of blue light will appear. Enter the light and you will be transported to Misty Grove. Follow the path and you will find a party already in full swing, including your drinking buddy Sam. Sam will eventually reveal that he is actually the Daedric Prince of Debauchery, Sanguine. He will tell you that he was introducing some merriment and subversion into the world and was encouraging you to go out and "have fun". The items he had you bring to repair the staff, it turns out, are pointless, and will no longer be quest items. Sanguine will reward your efforts to track him down with the Sanguine Rose and will teleport you back to the pub where you met him. All of the items in Sam's note are indirectly related to the quest: giant's toes are a reference to Grok, holy water is a reference to Dibella Shrine well (seems like Alto Wine bottles filled with shrine holy water), and a Hagraven feather is a reference to Moira. It has been reported that starting this quest when you have the Markarth bounty glitch (with the guards entering a conversation loop and never allowing you to go to jail or pay the bounty) fixes it, allowing you to finally pay your bounty. Ysolda's dialogue doesn't change even if you are already married to her. Also, if you asked her to live somewhere other than in Whiterun, you'll have to travel there to speak with her. There are a number of ways to bypass parts of the quest. At the start of the quest, you can go straight to Witchmist Grove and loot the Wedding Ring off of Moira, and continue the quest from there. Also, rather than getting the information from Ennis (by passing a Speech check or by bringing Gleda back), you can go straight to Ysolda. After the quest is completed, you may have a random encounter with an Argonian called Deep-In-His-Cups. He says that you and Sam owe him 10,000 gold for a bet because he ran into a bandit camp and almost died. If you say that you don't have 10,000 gold, he will attack you unless you pass an easy Speech check. If you pass the speech check, he will lower your debt to 750 coins. If you pay the debt (either 10,000 or 750 coins), he will go back to Black Marsh. If you cannot find Sam, you can use the console command player.moveto 000A96A0 to teleport directly to him. 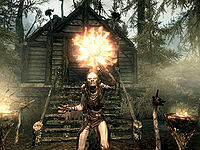 Sam can spawn at any of the inns across Skyrim, including those in towns, not just the ones in hold capitals. After completion of this quest, you may find Sanguine roaming around the fort Morvunskar, killing every mage he can find. Since he is essential, he will always win. Based on game data, an NPC called Drunk Cultist was meant to be part of this quest, but her reference is never activated. If you got a follower before starting this quest he/she might be in the jail in Whiterun once you've been teleported to the temple. 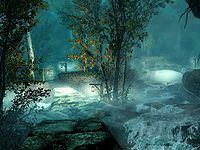 Teleporting to the temple will not count as "discovering" Markarth; if you have not been to Markarth before and fast travel away immediately upon exiting the temple, you will not be able to fast travel back. Instead, you may want to head to the city gates which will initiate discovering the city. The miscellaneous quest prompt to start A Night To Remember refers to Sam Guevenne as Sam Guenvere. If you successfully persuade and after that you still pick up those items you get a journal update to apologize but there's no such option in conversation (though it seems you don't have to pick up all of the items). If you have already cleared Morvunskar before starting the quest, enemies will respawn in its exterior, but the fort interiors will stay empty. Loot won't respawn as well. When Sanguine teleports you back to the inn after the quest, the map marker will still be pointing at Morvunskar. Even if you never picked up Sam’s note (for instance, by using persuasion or payment at the temple of Dibella) and thus never learned about the items supposedly necessary to repair the staff, dialogue options with Sanguine will still refer to you bringing along those items. It is possible that you will not blackout after the third drink. The reason for this is that one of the characters essential for the quest has died. This issue has been addressed by version 1.5 of the Official Skyrim Patch; Senna, Ennis, and Ysolda are now marked essential and thus unkillable. You can use the console to advance the quest using the setstage command. You will need to resurrect the dead NPCs first (all three must be alive to start the quest). To resurrect an NPC type prid refID into the console, followed by enable, resurrect 1, and moveto player (the refIDs are 263CD (Senna), 1CB2B (Ennis), 1A69A (Ysolda)). Sometimes the trash in the Temple of Dibella or Moira won't appear. If you return to Misty Grove after the quest you will be permanently stuck there. Reload a save from before you entered. Sometimes Sanguine might not appear at all. If you persuade or bribe the priestess, then pick up all the trash anyway, the objective to apologize to her will appear, and she will become a quest target, but you can't apologize. You can skip/fix this by leaving the temple, going to Whiterun and talking to Ysolda about the ring. It is possible that when talking to Senna that the dialogue may crash thus not allowing to ask about Sam and preventing any further progress in the quest. ? This bug can be fixed by talking to Ennis in Rorikstead. 5 I have awoken in the Temple Of Dibella in Markarth. Sam and the staff he promised me have disappeared. 10 I have awoken in the Temple Of Dibella in Markarth. Sam and the staff he promised me have disappeared. I have no idea how I got here but a priestess has told me I trashed the Temple. The priestess might tell me what happened to Sam and the staff if I pick up the place. 30 I have awoken in the Temple Of Dibella in Markarth. Sam and the staff he promised me have disappeared. I have no idea how I got here but a priestess has told me I trashed the Temple. I have cleaned up the Temple, if I apologize to the priestess she might tell me what happened to Sam and the staff. 40 I have awoken from a night of debauchery with no idea what happened. Sam and the staff he promised me have disappeared. The priestesses of Dibella have told me to ask about Sam in Rorikstead. 50 I have awoken from a night of debauchery with no idea what happened. Sam and the staff he promised me have disappeared. Ennis in Rorikstead will tell me more about what happened once I return the goat I stole from him. 75 I have awoken from a night of debauchery with no idea what happened. Sam and the staff he promised me have disappeared. Ennis in Rorikstead will tell me more about what happened once I return the goat I stole from him. 85 I have awoken from a night of debauchery with no idea what happened. Sam and the staff he promised me have disappeared. A note of debt I gave to Ennis in Rorikstead has directed me to Ysolda in Whiterun, she might be able to direct me to Sam. 100 I have awoken from a night of debauchery with no idea what happened. Sam and the staff he promised me have disappeared. Ysolda in Whiterun will give me more information about Same [sic] once I return the ring I borrowed from her to give to someone in Witchmist Grove. 115 I have awoken from a night of debauchery with no idea what happened. Sam and the staff he promised me have disappeared. Ysolda in Whiterun will give me more information about Same [sic] once I return the ring I borrowed from her to give to a hagraven Witchmist Grove. 135 I have awoken from a night of debauchery with no idea what happened. Sam and the staff he promised me have disappeared. Ysolda in Whiterun has told me to look for Sam in Morvunskar. 200 Finishes quest "Sam" turned out to be the daedric prince of debauchery, Sanguine. 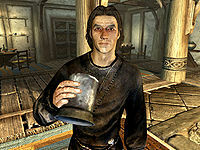 He spurred me on during a drunken night of revelry that crossed all of Skyrim. I've acquired the Sanguine Rose for my troubles. DA14Start: 10, 30, 40, 50, 60. DA14: 0, 84, 110, 130, 165, 175, 185. On the PC, it is possible to use the console to advance through the quest by entering setstage DA14 stage, where stage is the number of the stage you wish to complete. It is not possible to un-complete (i.e. go back) quest stages, but it is possible to clear all stages of the quest using resetquest DA14. This page was last modified on 2 April 2019, at 14:49.